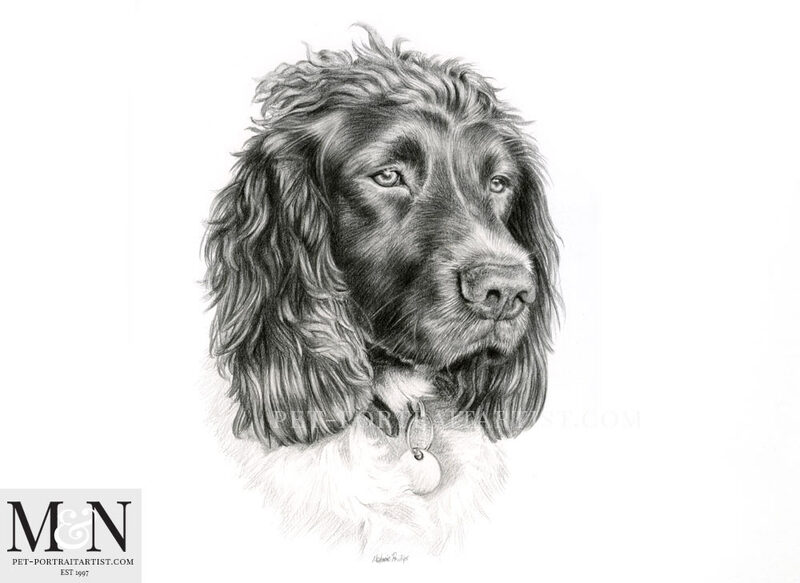 Welcome to my Spaniel Pet Portraits of Bren and Bee. 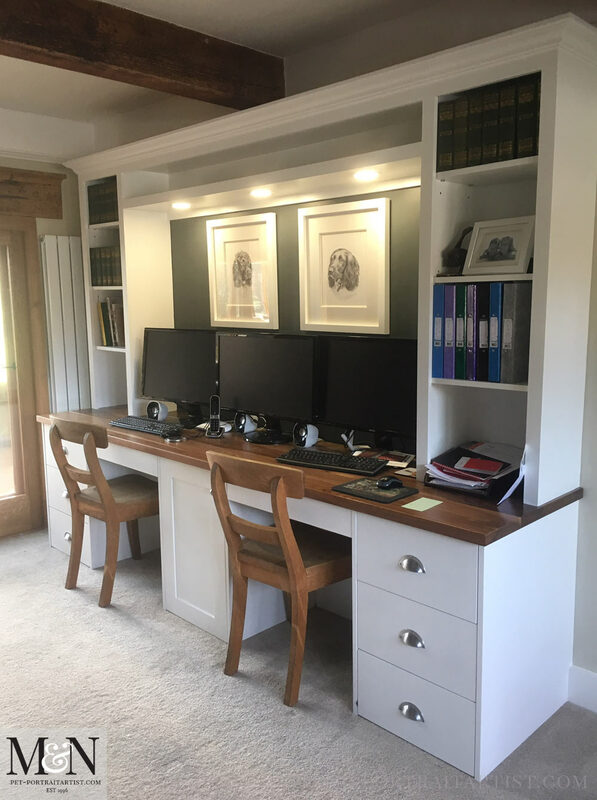 My client Helen saw one of my pencil drawings at a friends house. 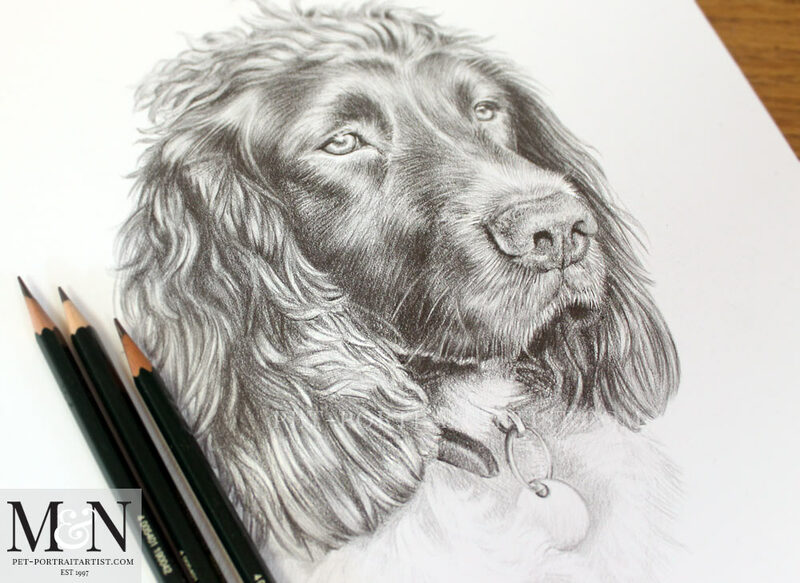 She had actually been looking for a pet portrait artist to create portraits for her of her spaniels and hadn’t yet found one. Her friend gave her our details and Helen got in touch! 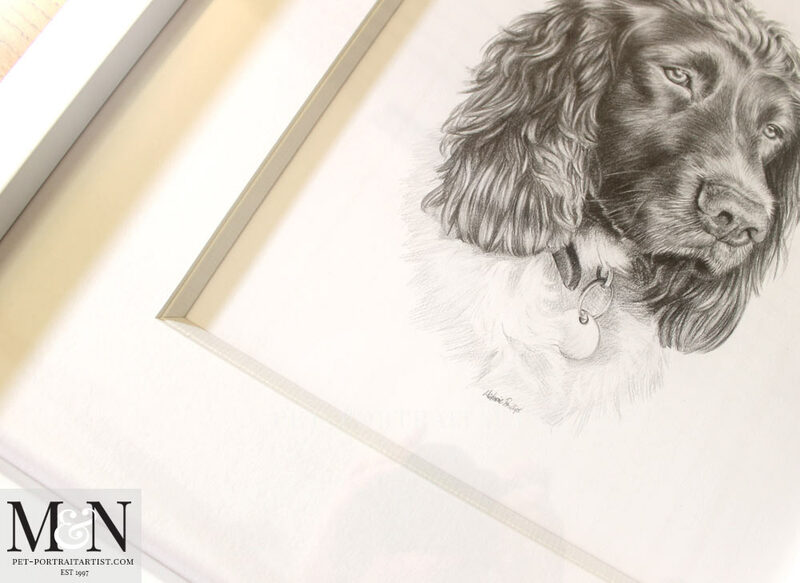 She wanted to commission two pencil drawings of their spaniels Bren and Been framed, for her husbands birthday in March 2017. We chatted on the phone a number of times and Helen took lots of new photos, particularly of Bren, as she wanted to capture his ‘look’ and expression. He has the most wonderful mop of curly hair and it was so fun to draw. Both portraits were created at 12 x 10 inches size. Helen sent me the most wonderful email when she saw the final scans and photos. OMG they look amazing!!!! I love them, I think he might actually shed a tear!! We packed them up and sent them using a Parcelforce 24hr service, however due to all of the snow here in the UK, that came over from Siberia, there were hold ups. The portraits took three days to arrive to Helen. What a worrying time for us all! They arrived safe and sound though and Helen emailed…. 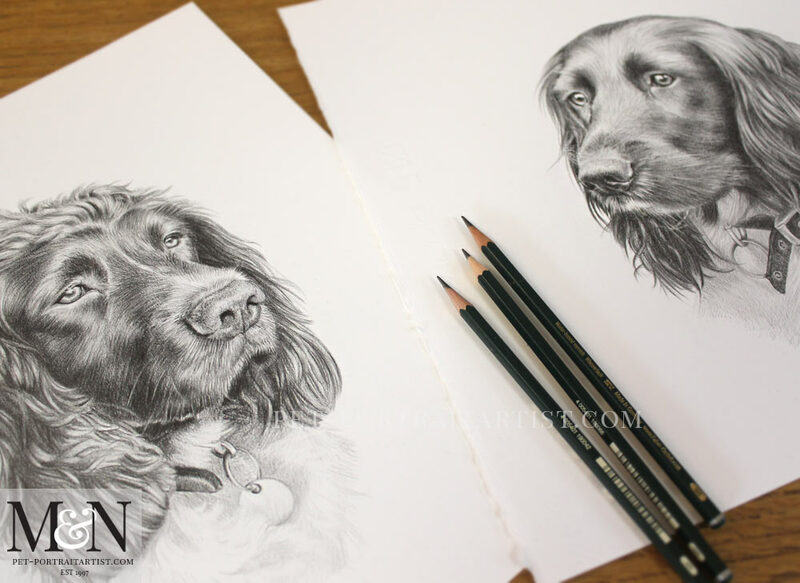 If you scroll down you will see lots more photos of the pet portraits….. Here are a few photos I took of Bren and Bee on my man chest with my pencils to help show scale. I always feel that the portraits look much more natural like this. They show better than the scans because often they can look too harsh. 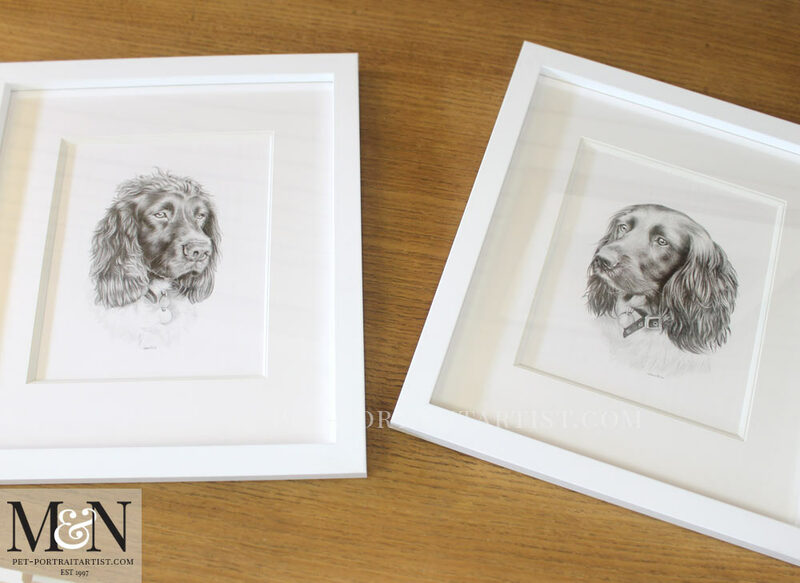 Finally Helen asked if she could have her portraits framed using similar mouldings to other artwork in her home. She sent a photo of the ones she currently had to match. My framer pretty much matched them. If there are frames to need matching, they can always find something similar or spot on. 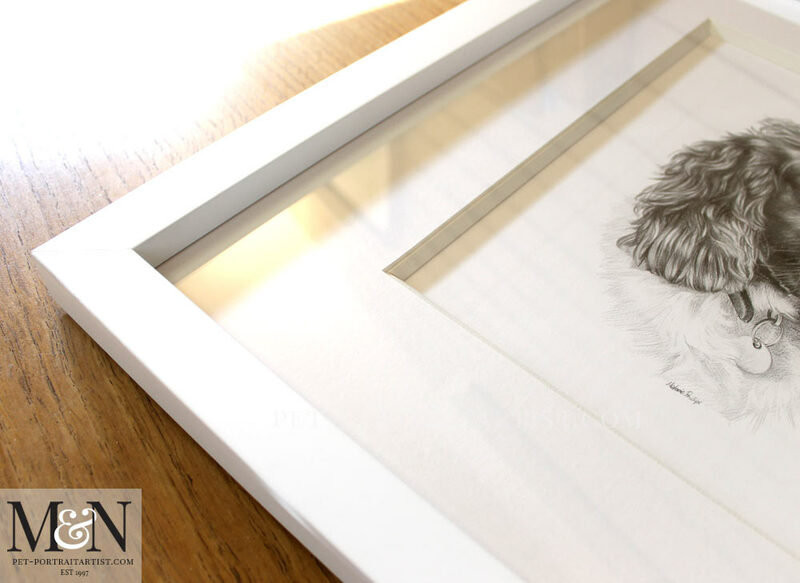 My framer created the frames and also the most amazing mounts which are much deeper than our usual mounts. Almost three dimensional with a bevel. I’m sure we will be using the mount system like this in future portraits. I hope that you like them! 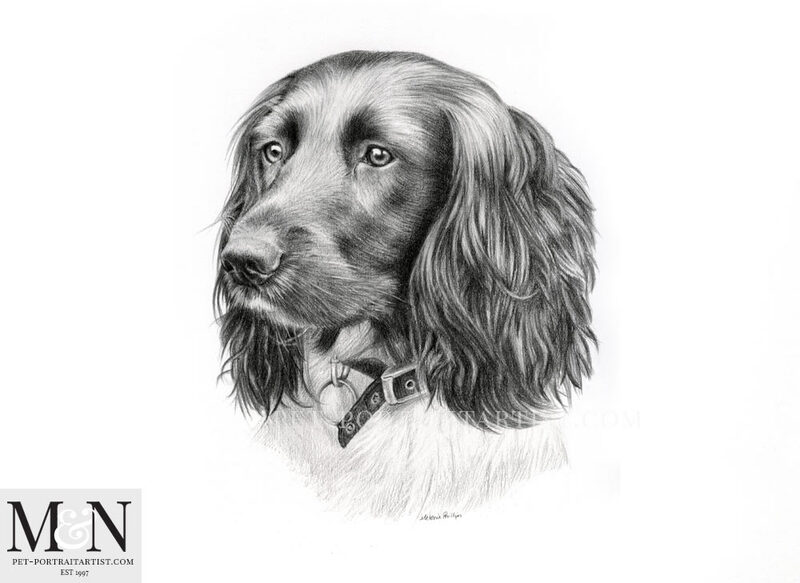 If you would like your spaniels drawn similar to this, please do email me via my pencil pet portraits website at any time. We received these three wonderful photos from Helen of the portraits displayed in their home. 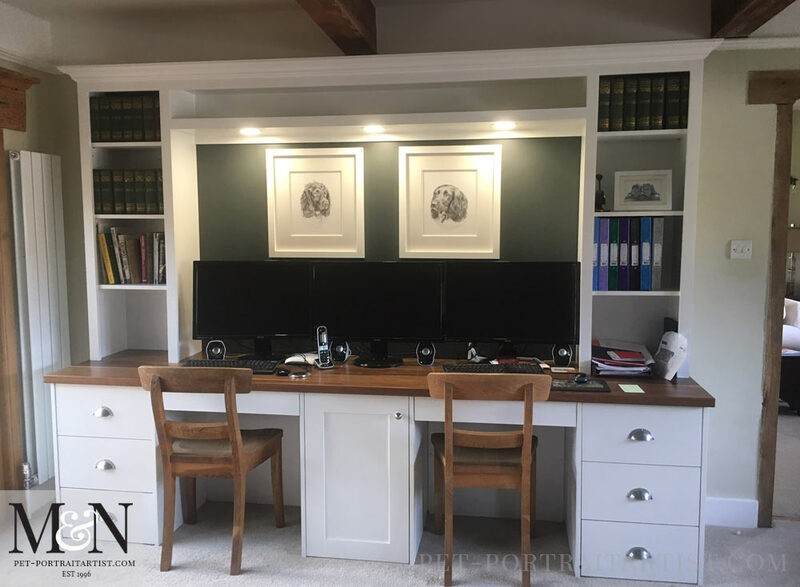 We love the colour of the wall behind, it really brings out the white frames beautifully. 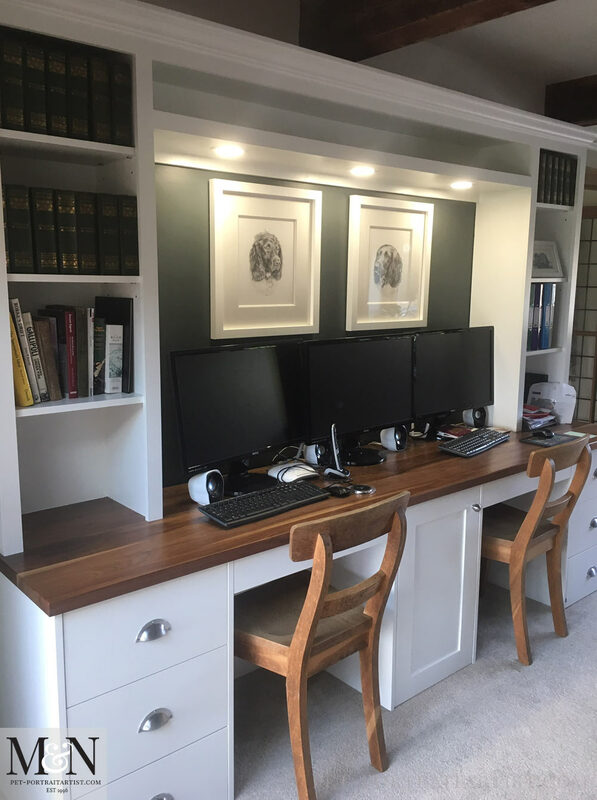 They also match in extremely well with the office units too. Thank you so much Helen for taking the photos for us to use on our blog and website too! !